"Two of my counties have a zero percent unemployment. This has been very positive." Zero percent unemployment?! I don't see it. I don’t care that someone actually out there said it... even if it was a congressperson. The news criteria of a quote makes a source does not trump simple verifiable factuality. There are no counties in Pennsylvania with zero unemployment rates. Nor any that close. By historical standards, most all PA counties have some pretty high unemployment rates these days. Yet someone thinks it's zero in not one, but two whole counties?? "(Marcellus Shale) has already fueled a downtown construction boom in Pittsburgh." Really? Why do people say these things? Let's go through it. In Pittsburgh the biggest Downtown construction of late has clearly been the new PNC Tower. The decision or at least the idea to build the tower clearly dates back to late 2005 at least and its construction decision appears to have been influenced by a sizable TIF offered by city/school district and county. Hold that TIF thought for a moment. So if that was really a Marcellus Shale influenced decision back then, someone was really really prescient down there at PNC and on the 5th Floor. If that construction is not what the author thinks is shale gas related, then it must be the score of highly subsidized (in one form or another) Downtown condominium developments that have been completed in recent years. Most of those date back to decisions in the mid to early 00's or earlier. The connection to Marcellus Shale in them is what exactly? Let's see.. there were the two big bank operations centers built in town? Not really recent enough to be considered related to shale gas unless someone was really really looking into the future. Would have required help from the custom Delorean. I know, he was thinking of almost completed tunnel construction and related. The $524 million in construction North Shore Connector and Downtown T station reconstruction is really a stealth way to get around the ban on drilling for shale gas in the City of Pittsburgh. We all know the Port Authority is never going to have the money to buy or even operate cars on the new spur line. Of course the decision to build the NSC dates back to decisions decades ago. . The Casino.. that must be it. The Casino built on the same spot as the once planned Riverboat Casino here in town and resulting directly from a state licensing process that all but required it to be built in the city. Don Barden was talking Marcellus Shale all the time. Again, there must be frac(k? )ing equipment buried under the poker tables. The entirely public Grant Street Transportation Center was built not all that long ago? That would be a hard argument to connect to shale gas. Those workers coming in from Oklahoma and Texas were not getting here by Greyhound as best I can tell. What am I missing? The New African American Center and it's wing devoted to minorities working on Developing shale gas in the Pennsylvania T (the other T that is). Oh wait.. I forgot the Consol Arena. Named at the time for more of a coal company ironically... but built with public money through and through. Point Park construction? Duquesne construction? You have to be proud of me. I made it through all of that without mentioning the obvious issue with the oped.. namely that the Marcellus industry is actually doing all it can to boycott the City of Pittsburgh which would impact especially its downtown. The author must not have received that memo. Florida, schmordida. Border Guard Bob may have indeed had a real impact, though not in the way it was intended. They should no longer allow the use of stock photos that show the fountain at the point working. and btw.. That tiny little piece really confuses the whole city/region issue. There is stuff we will be putting out soon that might send the city interpretation of a lot of the aging metrics to the archive file. addendum from the random neuron: Remember not so long ago when we were considered a "Tax Hell" for seniors? Numbers are messy. I know we like to treat numbers and precise and concrete, but it just isn't the case. So you know I just have to react to this factoid in the news. Via the PG and BikePgh I see the headline factoid that bicycle commuting is up 269% in Pittsburgh. To be clear, I wish it were true that bicycle commuting was up that much. I think Pittsburgh has a great bike history, a lot of great bike amenities, has had some great bike leadership, and I have no doubt a great bike future. But +269%? Maybe.. but also possibly maybe not. The literal number of bicycle commuters for the City of Pittsburgh reported in the 2010 American Commutny Survey (ACS) was 2,267. The margin of error reported with the ACS on that specific number was +/- 824. Big range there. Again, the large relative error is due to the small size of the city and the really small size of bicycle commuters. The ACS is a sample frame of roughly one in 100 households in the general population annually.. higher oversampling happens for smaller groups or smaller geographic areas. So the 2010 data the reported 2,267 bicycle commuters living in the City of Pittsburgh likely comes from the survey capturing just a couple dozen bicycle commuters. Not a lot to work with. So what has the ACS been telling us year in and year out? Here are all of the comparable ACS results on bicycle commuting of City of Pittsburgh residents. ACS results before 2006 did not include Group Quarters population and so I would not consider them comparable to the others. Shown are just the ranges made up of the estimates plus or minus the reported standard errors. The ACS reports different data based on compilations of data over 1, 3 or 5 years. The 3 and 5 year compilations have more data and thus smaller proportional sample errors than the 1 year estimates. So a lot of confusion over any one point estimate is the fault of the Census Bureau resulting from the elimination of the long form of the Decennial Census. The result is that we are all going to be forced to rely on data from the American Community Survey(ACS) for most all data like this. The problem is that as a survey, there are limitations that are not always appreciated. The message the Census Bureau tells a lot of folks like me to spread is that you have to take into account that smaller areas and in particular smaller populations can have results significantly impacted by sample error and other issues. Bicycle riders are a small population for sure. Clearly there was a big jump for sure from 2000 when the reported number of bicycle commuters was 627. In absolute numbers that works out to a percentage increase far larger than +269%. Not clear to me from what I have read on what the 269% refers to specifically actually. The actual increase could actually be higher depending on what is being measured. This is all a good learning exercise on how to use ACS data which will be coming out nearly continuously from now on. If you think that the number of bike riders is relatively stable, or at least changing in a consistent way then reconsider the graph above. Reality probably does not jump around all that much. So yes, all of those ranges show an increase over 2000. When that growth happened is another question altogether. If you look at the high end of the range in 2007 and the low end in 2010, it is at least conceivable that the number of bicycle commuters has gone down over that time. Over the decade though, the number of post-secondary students in the city proper has gone up a lot. Those folks are disproportionately non-auto drivers. If students report that they are working as many are even if part time, they will be asked their mode of commuting and in most cases their response will be included in the results for commuting data. With something on the order of 10K more undergraduate or graduate students living in the city since 2000, I have to believe they are a big chunk of the increase in bicycle commuters showing up in the data. So you might think things are trending down for the regional economy if you take verbatim any of the stories today on the unemployment rate ticking up (PG, Trib, PBT). True the unemployment rate ticked up a huge bit, 0.4 % points, between July and August. A big jump for sure, but not all unemployment rate increases are the same. You really won't catch this if you read the news, but consider at least these two things on the state of the region's labor market. 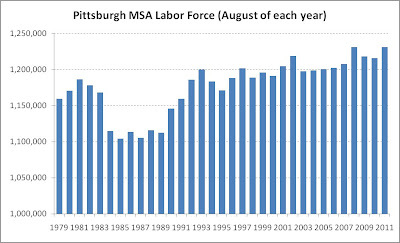 With data for August it has now been 59 months since the unemployment rate for the nation was lower than that for the Pittsburgh MSA. The national unemployment rate for September will be relatively stable and it is an awfully safe bet that there has not been a huge convergence of the two time series in the last few weeks. If true then September 2011 will mark 60 months, or 5 complete years since the local unemployment rate has been better than the nation's. You will not find any other comparable period of time in the past that has ever been true. The bigger news story is something else. The Trib almost gets there and kind of mentions the fact that the labor force is indeed trending up. They say the August numbers just out are the largest labor force numbers for the region since December 2008. There is seasonal hiring that often kicks in for December which obscures the point a bit. To skip the seasonality, here are the August labor force totals for the Pittsburgh MSA (current 7 county definition) going back to the late 1970's. So yes, the labor force count for August is exactly tied with August 2008 for the largest labor force total for an August in the region's history. History. All time. Ever. During a time when the national news is all about the lingering impacts on the labor market of the recession now ended, long term unemployment and declining labor force participation as folks become discouraged just about everywhere. When you consider the obvious fact that there is a recession some other things are worth thinking about. Recessions have a general impact of lowering labor force participation. No reason to think that isn't happening here as well. Relative strength or not, the absolute unemployment rate is higher than normal. The long term unemployed are likely dropping out of the labor force as they are elsewhere. We also know school enrollments in the region are up. Students tend not to be in the labor force as much as others, so that tends to push down labor force participation a bit. So a high labor force coupled with lower labor force participation equals something completely unmentioned in any of the news coverage as best I can tell. The number of people jumping in and out of the labor force is not anywhere near as variable as you might think reading the generic explanations of why the labor force data changes month after month. That movement in and out of the labor force exists of course, but long term there is this much bigger factor across the nation called migration that is what really changes the size of regional labor forces. So what does it mean for Pittsburgh today? At some point in the 1980's the unemployment rate was exactly the same as it is here today. Does it mean the economic conditions back then have anything in comparison with today's? In the 1980's the metrics of unemployment would have been far far worse than they were for the entire decade if so many unemployed workers did not leave the region. Today, is the regional unemployment rate trending up because of deteriorating economic conditions? Or is it because we are pulling folks into the region by the relatively stronger economy compared to a lot of other places? County says it is behind in commercial property assessments. Judge says city of Pittsburgh properties must be done first to facilitate bills and prevent need for a tax anticipation bond. There is this little problem. Look again at the graphic of where city property tax comes from. That big Downtown bubble there... not being generated by residential value. So to calculate revenue neutrality for the city... you really have to have commercial values I would think. and yes... the web site for Three Rivers Stadium is still still still there! Someone clearly has lost the password. That and someone paid for that domain in perpetuity. Maybe someone just forgot to send the memo to the accountant who pays those bills that come in. Too many spooky things connected with Three Rivers Stadium for sure. It has been a long long path from where this all started. And then there are all the spooky things about the stadium. I read this article and really couldn't believe it. ComputerWorld of all places has this story today: Pirates tap BI tools to forecast, boost attendance. Notice there is no mention of improving on field performance as a means to improve attendance. They just want to narrow in on what poor folks are still willing to sit and watch another losing season. Hey, I'm all for applying wonkery in all the weird corners of the world, but there is something perverse about that story and the Pirates endless losing streak. Moneyball is about how Billy Beane used some fundamentally econometric techniques to actually improve Oakland's performance on the field. The Pirates' version of that skips the box score and focuses entirely on squeezing more efficiency from the box office. I think that article says it all. No matter what appeared to have happened at mid-season (we will skip the obvious pension analogy).. does this picture show anything different this year compared to any of the 18 that preceded it? Still a few days of pain left. Might wind up being one of their relatively worst years. Also from the story last week on the city's budget. The city is open to floating a bond this year it says. No surprise there. Read the Bond Buyer also from last week on the current "eye popping declines in muni yields". For those who can get them at least. Remember the curious bond that wasn't? At this point, anyone who can float a bond will probably think about refinancing all that they can. Which is one reason I found this headline on a recent SEA refinancing to clearly miss some basic facts of life in the world of finance: "SEA lowers its costs through perfectly timed bond maneuver". There is no 'perfect timing' in these things.. or at least you wouldn't know it was perfect timing until long after the deal. If they had waited they probably would have done even better. But you can't expect anyone to pick the future in a financial markets like that. You certainly don't want public officials trying to outpick the market. You make the best decisions you can and structure deals best you can. Knowing the future can always have a downside is one reason you generally don't lock yourself into noncallable bonds*. So, barring those those who can't do so for one reason or another, at this point most any large bond out there that has not been refinanced in the last year or two probably is going to be looked at as a candidate for refinancing. * And since everything really does come back to the city's pension funding. Remember again the city's pension bonds of the 1990s. One big criticism of them was that they were issued noncallable for many years and thus could not take advantage of lower interest rates for a long time, if at all. Any other noncallable, or effectively noncallable, bonds out there in the local muni-sphere? I've noticed there have been some really odd survey questions being posed by the PG online of late. This one from last week may be in a class by itself. Does the question itself make any sense at all? Even if it does, what about the range of answers respondents could choose from? What is the purpose of a survey question like this? You think they could have at least given a 4th option like they usually do even with much narrower questions. How about putting Bernie Madoff in there as a choice? So here is something I should have noticed. I actually will sometimes look at what the state's revenue reports look like. The story today on the state of the city's budget has a real bonus in there. The city received $10 million more than anticipated in aide from the state for municipal pensions. The line in the Post-Gazette story is that "Officials weren't sure why the city and other municipalities were getting extra money this year". There is no mystery here at all. 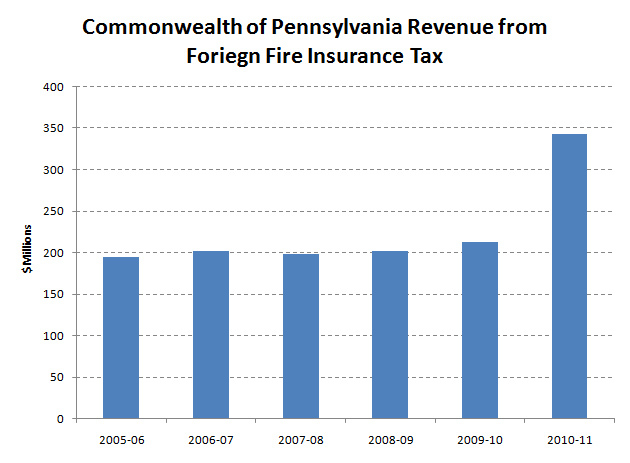 Pennsylvania distributes pension aide to local municipalities from a single dedicated source, the Foreign Fire Insurance Tax. So the more comes in from that tax, the more goes to the municipalities. You might have thought the recession would put a damper on that type of tax, but I guess we are becoming a risk averse (i.e. insurance loving) society.. That or insurance premia are way up? I'd like to know which it is actually. update. PG has more now on the 'windfall' across the state. 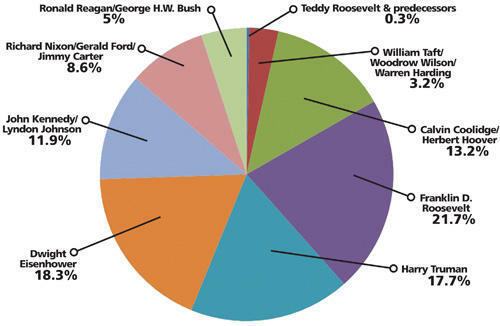 The graph below is merely an artifact of a statutory change in timing of when the tax was due. Need to think about the timing of this some. Is is a one time boost or will next years $$ take a hit from the baseline. Bottom line no matter is: don't plan on this next year. From the June revenue report you get the fiscal year to date data for the 2010-2011 fiscal year in Harrisburg. Below is the trend for the revenue stream dedicated to local municipal pension. You will see a big big jump in the fiscal year that just ended. There is a related story here. It was not any goodwill toward Pittsburgh in particular that gave us a boost. That boost in state aide went to most every municipality receiving pension aide from the state. Should be a lot of happy local officials out there with some 'free' money hitting their books. Anyway... if we looked at that June report that came out last month, it should have been obvious a big(or at least bigger) check was coming our way. See the WSJ today: Select Cities See Brain Gain. #8 we are on on a list of largest growth in percentage of population with a college degree. and even that still misses the impact of age on that metric. Our older demographic washes out some of the change as it would work out in that calculation. If they redid any of that looking specifically at younger age groups, or even just the working age population, I bet we would have wound up even higher. The relevant thing is the amazing generational shift here when it comes to educational attainment. So if you saw the stories today with info on latest dump of the American Community Survey... from that same data you can see this pattern in educational attainment by age for Pittsburgh. Note this is an updated version of what I had produced in the past which many have seen. Things that fascinate me. From the Legal Intelligencer on Marcellus Shale induced migration to Pittsburgh... of lawyers of course. Ok then... We've become the place to self-actualize. The New New Pittsburgh. I was born somewhere else. Addendum: Much of this is beyond me, but that article is already mentioned in some interesting legal meta-analysis put in the ether in this blog post: Where Are All The Pennsylvania Fracking Water Contamination Lawsuits? I won’t say it means anything, but on page 14 of each there might be something missing. Just an oversight I am sure. and just as some debate who is responsible for what. Every Act 205 report submitted by the city of Pittsburgh since the act was passed was signed by the city's Finance Director, until now. You will see if you dig into it there are reported large employer contributions into each of the plans. These are the values of the ‘asset’ created by the promise of future parking revenues. I am a little curious how that ‘asset’ was divided among the 3 plans. Because of all the machinations here and all this new accounting, it really is impossible to tell from this how much each pension system has in liquid assets. Why does that matter? Cash still matters if you have to send out a check. Not really news, but look closely at the very last page of the police pension report. Basically without the pension bond of the 1990’s the fund for police would have been broke all the way back at the beginning of 2009. Note the top number there which is literally zero. If the pension bond had actually been a pledged revenue stream, there would potentially have been a big problem by now. Even with the large infusion of this 'asset' the city's Minimum Municipal Obligation (MMO) is going up from $38.1 million annually to $44.9 million annually. That is what has to be paid in addition to the parking revenue pledged into the system. What is a bit interesting is that the MMO's for the police and nonuniformed employees stayed pretty much the same, but the MMO for the fire pension system almost doubled from $7.9 million to over $14 million annually which is driving virtually all of the aggregate increase in the city's MMO. Am not sure what is going on there that is any different from the other two plans. Bigger personnel cuts in recent years is probably a big part of it. OK... for those who have already written thinking I am nuts, apologies for my abuse of Schrödinger. While clearly from a worker perspective and some of the specific numbers are for Rhode Island, much of this primer on public pension problems is pretty much spot on for the state of public pensions in Pittsburgh. There is an almost infinite amount of fodder provided by the city’s pension funding resolution. You could have a whole public finance course discussing nothing other than this one little episode. Granted it’s all fiction, but since everyone else is going along, why fight it? In fact, it may be a lot more fun to discuss the financial engineering of it all now that we are past the politics. Let’s assume that all this mattered and deconstruct what actually happened. We need to do a thought experiment. So let’s start with a box. No cat in the box. The box is a financial transaction. The box contains the principals to the transaction and nothing else including Party A, which owes a large sum of money to Party B. Party A borrows a large sum of money and transfers it to Party B to pay off the debt. Now Party A owes regular payments to the lender. If we had an omniscient observer to what was going on inside the box, the observer would conclude that Party A had increased its debt. It had borrowed money in exchange for a long period of future payments. Debt is debt is it not? Now there is nobody else in the box, so it just happens to be that Party B is the lender as well as payee. Sounds strange, but it has a clear analogy to lots of business transactions where someone owed an unsecured debt formalizes the debt with a contract for future payments to pay off the debt. So first off… did the city’s debt in all of this go up? The omniscient observer would say yes. Yet the whole point of this exercise was to not have the city’s debt go up. Call it something else if you want, but the city just had its total formal debt outstanding jump by a large amount. Funny nobody wants to talk about it like that, but it is hard to escape that reality. Then there is the cat which I said was not in there in the first place. Dead or not? City pension: Funded or not? The questions are not as different as you may think. Now the painful truth. City has just taken on a large debt all toward funding the pension system. What has been created through sheer force of will, chutzpah, and financial alchemy is really no different from a Pension Obligation Bond. Really not much different from the pension bonds floated in the 1990’s to the tune of around $290 million only to have the markets and pension payments gradually erode the $$ put into the pension system. The analogies to the pension bond are multifaceted. Everyone happy that the pension system is now funded at 62%. Guess what? After the pension bonds of the late 1990’s were floated, the funding status of the pension system was a disturbingly identical 64% at the end of 1999. So we have been in exactly this place in financial space once before. Both times everyone declared victory in 'solving' the pension crisis. Was not a solution then, and likely is not a solution now. Now the nails get pulled across the chalk board. Did the city get a good deal on its loan this year? Can’t quite call it a bond since there is no known bond prospectus, de jure or even de facto, in existence. In the 1990s the pension bonds were for $292 million. At the interest rates of the time, it would have worked out to coupon payments of $18-19 million annually. So the payments specified here (13.4 mil. leading to 26.4 mil. annually or an average of ~$23 million if you work it out) are actually much larger than the payments incurred by the older pension bond. Yet the calculated value of the payments today, $238 million or so, are strangely enough lower than the funds that the city received from the old pension bonds which was $292 million in cash. So despite the fact that interest rates are much lower today than in the late 1990’s, the city is paying out more and receiving less in comparison. This all an artifact of the difference between the interest rates back then, around 6.5%, vs. the 8% discount rate used to calculate the NPV value of the new debt. The current ‘loan’ was not made at any market interest rate (since there was no market involved.. market is outside the box), but effectively at a rate set by the discount rate used in the NPV calculation. That cat is becoming a bit easier to understand in a relative sense at least. Basically the city has borrowed money at a fixed 8% interest rate. Bad. But at the same time the lender is getting a high return on its lending. Somebody is guaranteed an 8% annual return. Since borrower and lender are both in the box and the lender is pretty much the city pension system.. a high guaranteed return is good. So did the city win or lose in the whole deal? Confused? You bet. But it does not matter, it is all paper. The box also had an event horizon that was defined by the accounting system of the city of Pittsburgh.Clearly a black hole in itself, but everything happens inside the box. There was no outside money involved, not any outside parties. We will call PERC the omniscient observer I guess, being outside the box and not party to any financial transaction involving currency, real or notional. All they were doing was observing, but as with the cat the observer can impact what goes on inside merely by observing. So everything we are talking about happened within the space made up of City of Pittsburgh entities and accounting. Nothing changed outside the box. Well, there you have it. The go away and come back later answer on the City of Pittsburgh’s pension ‘solution’ of the day. (Trib, PG). As a commenter here pointed out in the immediately previous post, the first payment from parking revenue into the pension fund is due a week from this Friday. Does the city even have that much free cash to ship over? On to other things I guess. More confusing things: Increasing property tax to send $3.25 million a year over to the Carnegie Library necessitates a city-wide referendum, but sending $14-$26 million (‘irrevocably’ no less) a year to the pension fund is a simple vote of council in December? How would the new incremental library tax be impacted by new property assessments? Does it get adjusted for anti-windfall legislation, or will it remain an extra 0.25 mills and thus likely wind up being a lot larger revenue stream? I am pretty sure the nominal tax base for the city in aggregate is going up, especially in nominal terms. If the city decides to alter the millage for the library tax, then does the Carnegie Library have some means to sue the city to get it back. In other words, is it irrevocable in the sense of the parking tax diversion (see first point above). So now that PPG is being sold according to news accounts… is the City of Pittsburgh again going to be left out in the cold on the potential transfer tax that would bring in. Is anyone working on the issue we brought up in the spring? A rhetorical question I know. (update: maybe city is going to get a transfer tax out of this deal. Stay tuned). The notional price is only listed as a $214 million investment. So if there is a potential 3% transfer tax (total for city and school district not including additional to state) out there, the ‘lost’ revenue is on the order of $6.5 million.. or nearly 2 years of the new library tax revenues. And from last week… If you missed the big public finance news out of Jefferson County where they also seem to have conflated all fiscal issues into their water and sewer system. Looks like JP Morgan is willing to take a big haircut and restructure bonds they set up with their county sewer system. Seems like the Pittsburgh Water and Sewer System could have used some similar consideration for their variable rate bonds causing such expense and consternation. Maybe we didn't ask nice enough? or maybe we asked too nicely? Who knows? But I confuse easily. and yeah, I changed the title. The allusion just kind of punched me in the nose. While the entire 5th floor awaits the binary yay or nay direct from Harrisburg, here are some funny pension thoughts. As I said, I suspect this all has to go through, ensuring pension gnashing on inifinitum. Basically the city has told the state that the promised future parking revenue that will be sent direct (dare I say 'special delivery') to the pension board for disposal is worth $239 million dollars give or take. The actual revenue stream is $13.4 million a year for the years 2011-2016 and $26.8 million for the years 2017-2041 per the legislation of December. I won't do the math here now, but many readers here know the financial calculaton behind that and it works out to a discount rate of 8% on that future income stream to work back into a net present value as of January 1, 2011. Here's the funny thing. When in each year is the payment made? If you do the math, it works out that the $239 mil NPV calculation must be assuming the payment is made at the very end of each calendar year. So the assumption is the 2011 payment will get transferred right at the end of 2011. Will be a sad side note if the city can't make the very first payment once the state says ok. I predict there will be many a year where the December debate will be whether the payment (transfer as it were) needs to be made. If anyone gets any other result from reverse engineering that, let us know. So to begin, there does not seem to be all that much guaranteed in any of that. In fact, it all sounds very very conditional when it starts with "for the purposes of Act 44...". Skip that issue for now. What gets me is the loose connection to parking tax revenue. What happens if parking tax revenues are insufficient? Nothing in that verbiage would inhibit the city with going ahead and selling/leasing the parking assets which would also take away the potential funding stream. Is there any clawback to a general obligation on the city of Pittsburgh's other revenues? Sure seems not to be the case in that it clearly identifies parking tax revenues for the only source of funds here. Is there some other supplemental legal contract that followed this up between the city proper and it's pension fund? Fodder for a public finance case study if nothing else. No matter for now and by end of day presumably it will be an entirely different debate one way or the other. Wailing and gnashing, or tremendous victory celebrations. All despite the fact that no matter what the state says today, nothing at all has changed impacting the long run financial health of the city of Pittsburgh. This all gives 'accounting fiction' an entirely new meaning. My guess is that the city will be saved by the bell if only because the folks at PMRS will just kill the folks at PERC if they wind up being stuck with Pittsburgh's pension system. Accounting fictions or not, will there be a literal cash issue at some point if all this goes through with so much notionality on the books? Seriously, I would love the legal minds reading here to tell me if an asset is an asset if you can't sell it? That and whether anyone really thinks the city's IOU to its own pension board could be sold to a third party for cash. I bet one of those advertisers on tv offering to monetize the annuities some folks have would be happy to make an offer. The interesting question is.. what would they value it at? Common Pleas Court Judge R. Stanton Wettick Jr. also ordered Wesley Graham, the acting chief assessment officer, to report weekly to him on the number of properties his employees handled each day. County officials appeared to lack "a sense of urgency" about completing the reassessment effort, Judge Wettick said earlier Thursday. New property tax bills are due to be issued early next year and Mr. Fitzgerald has said if elected he would refuse to mail them, even at risk of going to jail. Pattern and practice? You decide. It all must all be Ed's fault. Going to be an interesting spring in Judge Wettick's courtroom. and like those animals that sense earthquakes before they arrive.... don't you just feel news on the city pension front is inbound? In case you do not read the hockey news, there is a great story in the PG today focusing on how a new Penguins prospect was let down by GPS directions here in Pittsburgh. Reminds us of the famous musings of the late war correspondent Ernie Pyle who wondered if Pittsburgh was "laid out by a mountain goat". I've had all sorts of visitors coming into town with stories of how they were following GPS directions in town, only to be led astray. Also makes me wonder what might be new with the Pittsurgh Street Addressing Project. There was some relatively recent interest in the topic. yeah, yeah... Gerontocracy again. Still is an interesting research topic broadly. Deomgraphics, the timing of school calendars and the political environment here that heightens the role of primary elections all conspire to make the region here what must be the oldest political demographic in the nation. I speculate more so than most anywhere in Florida even. I bet a lot of those snowbirds actually are voting here if anywhere. So we are a harbinger of what voting will look like most everywhere else in the future. I am not sure the political scientists have fully taken grasp of what that means beyond the obligatory impact on Social Security politics.. but as we know, all politics is local and the impacts will extend down to every elected school board member in the nation eventually. and as much as folks don't like to hear it... low turnout is mostly a younger voter phenomenon. Old folks have much more stable voting particicpation. I have not figured it out yet, but I bet the spring election's low turnout was even more age-biased than typical in terms of who actually cast a ballot. As for this coming non-election in November. Let's see. No presidential election. Nothing interesting at the state level. Mayor, or mayors collectively? Nada. Yeah, the Allegheny Chief Executive race is a real barn burner. It may be about as bad as it gets this fall turnout wise which will means the ephemeral young voter will remain an oxymoron. Maybe that big library referendum will turn voters out within the city of Pittsburgh proper? "Pittsburgh had the largest number of areas with big houses"
Of their top 25 zip code areas ranked by size of homes we have: Mars, Gibsonia, Sewickly, Wexford, and Fox Chapel. update: I'm told I missed Venetia, PA (15367) which is on that list at #4 as well... so the zip with the 4th largest homes in the nation. That's kind of amazing. Venetia being Peters Township, McMurray and environs give or take. Interesting also because Peters Township is itself in the news of late. Makes me wonder if the Marcellus folks are going to threaten to boycott Peters Twp the same way they threatened the city of Pittsburgh. I'm sure none of the industry apparachiki live in Peters Township right? Yesterday the news of the day down at the Pittsburgh Water and Sewer Authority was about a 2009 report critical of... well.... just about everything. Seems to me the reporting on that should have included some tease at least of why and how a report from 2009 is surfacing now. Is not the real issue why an important analysis like that buried to all eyes. If not for emergent circumstances, would this report have ever been seen?? PG folks can be a bit overly subtle and the line about the folks currently in charge possibly not knowing about the report says a lot.. if not more than the report itself. Curious. Likely it is only being seen now because there is multifaceted litigation impacting the PWSA and the its once sewer line warranty contractor ULS. Since the report’s author has reported connections to ULS, the state of litigation sure makes me wonder about the timing of all of this. Remember, . it was reported that ULS was going to sue the PWSA over all of this. I don't know the status of that litigation, nor even if it was ever really filed, but a claim of $3 million against the PWSA has been listed in its bankruptcy filings as its most valuable asset. ('asset' is becoming an ever more fungible term in this town) There was also a status conference on the ULS bankruptcy just on Friday a few days ago and exactly a week ago there were arguments in Commonwealth Court appealing Judge Wettick's ruling that effectively shut down the warranty program, thus precipitating the bankruptcy in the first place. Seems to me both of those events might have some more relevance to the future than the 2 year old report at this point. Is there really anything in the old report that is any more than documenting the obvious I wonder. On the report in the news today… critical as it is of the PWSA it brings to mind a few fun thoughts. Remember it was just a few months ago that the City proposed to the ICA that instead of merging its accounting system with Allegheny County's, it instead wanted to ‘save money’ by merging the city’s accounting system with the PWSA’s. I was kind of rooting for that to happen, just because I really wanted to try and read the city's budget in Malaysian. How is that merger of city and county accounting systems going anyway. Lots of progress I bet. And this is a fun time to bring up what remains a mystery to me, and there are so few mysteries left. There must be some niche shoe maker in France named Deasy. Why? There is a slow but steady stream of hits here from somewhere in France as different people search for "Deasy Shoes". I've not been able to reverse out what they are really looking for. Must be a very bespoke shoe. and kids... the water ballon and potato gun idea... bad bad idea. Gives Steampunk a whole different meaning. I am not sure anyone has really considered what is the real worst case scenario in the city’s pension pantomime of late. It may be hard to follow along, but this seems to be the default path at the moment. So go read from Saturday’s the Trib’s report on what is going on between the state and the city over whether it will consider to accept a pledge of future tax revenue as an ‘asset’ on the pension funds books. Sorry, there will be a lot of apostrophes in all of this, it’s unavoidable. The key issue at the moment seems to be whether or not said ‘transfer’ actually happened at all. The asset was a pledge of $735 million in tax revenue spread out over the next 31 years and presumably valued by its net present value in today’s dollars. The legal issue seems to be over whether any enforceable ‘transfer’ took place of those revenues. It is supposed to be an outright transfer.. as in the pension board all but ‘owns’ those revenues and there won’t be anything the city can do to stop those payments in the future. Irrevocable would be the term. That is about as simple as I can make it. Hold the thought, but remember the’ irrevocable’ part. The goal was to prevent the state from taking over the city’s pension system. One outcome of that was that if you looked at the state’s own actuarial report on the city’s pension system… if it were to be taken over the city’s minimum payment to keep the system solvent would ramp up to just under $160 million a year in 2030. Skip for the moment the basic issue that that might indeed be the level of payments the system requires. So now presume for a moment that the state takes over and the city is now on the hook for those large new payments. Remember the ‘irrevocable’ asset? That is owned by the pension board and will not count against the required payments per the state’s report in the previous link. You see where this is going? I speculate that the default outcome at the moment is that the city is not only going to be on the hook for the new payments to the state per the report in the previous link, but it has to make those after and on top of the revenues from the pledged ‘asset’. Both will be what hits the city books in a few years. Is this an inevitability if the state takes over? If the pledged asset can be taken back, or if those revenues count against the city’s up front contribution requirements… then were they an asset of the pension board in the first place? It sure seems to me that city has painted itself into a corner. A very expensive corner. Via the folks at Space.com and astronaut Frank Lee Culbertson Jr (CAPT, USN(Ret. )), who was the only American not on Earth at the time. A decade or so earlier I worked at the World Financial Center next door to the WTC and would walk though the WTC underground plaza daily as part of my commute. The daytime worker count in the WTC was something on the order of 50 thousand. I remain in awe to this day of the miracle that so many got out. Elimination day has come for the Pirates. What is remarkable is that despite the mirage of July the end came right on schedule. Pittsburgh wants a winner Mr. Nutting. In the absense of a winner we have proven we will root for anyone who steps up to the plate. We want Baseball. We're so thirsty for it we'll crawl through the desert toward the mirage of merely a winning season, and when we discover there's no mas, we eat the bullpen dirt. Note the sentence from the other end of Cleveburgh.... "especially when the rival Pittsburgh Steelers are in town". I'm thinking of trying to calculate the economic impact SteelerNation exports to other regions of the country. I'm not sure anyone has ever come up with a number for that. Which Pittsburgh are you looking at? It's possible that I may have contributed to a few stories not making ink. If even partially true, it wasn't my intention. I believe there was interest in a report Brookings released today: Education, Demand, and Unemployment in Metropolitan America. You can see a selection of those stories from around the country. The curious thing was that they had Pittsburgh listed in the top for their categorization of regions listed as "unfavorable Education Match; Favorable Industry Compostion". That group was defined as having an 'overall education gap' that was a big contributor to local unemloyment. Basically their point is that Pittsburgh is undereducated in its workforce. Education being the broad taxonomy of high school, college, graduate school; basically years of education. It was not talking about skills mismatch in very specific occupational categories. These regions are also described as having "unemployment rates above the national average will tend to persist until they can either boost educational attainment". Problem is that as readers here know, the regional unemployment rate is below the national unemployment rate by a lot, and has been for what is now a historical length of time. As for educational attainment, you can look at parts of the labor force, the younger parts, and conclude we are among the most highly educated in the nation. If you look at the highest levels of education, those with graduate and professional degrees, I think the Pittsburgh region's younger workforce is the single most highly educated inthe nation. So what gives? Educational attainment is typically measured across the entire labor force. Some standard measures of educational attainment actually look at the population age 25 and over which is even broader. Our older demographic, coupled with what was a very blue collar labor demand a generation ago means our older generations don't quite have the credentialed education of the folks finishing school today. The younger parts of the workforce is what truly represents how we have been doing as a region in terms of supplying workers. It's not to say the methodology was wrong in the broad report in the news today. Pittsburgh is an outlier in the scale of change in this sense. So for most regions it is a decent measure to look at the educational attainment broadly, but for Pittsburgh it misses some very fundamental changes that have taken place in a very recent timeframe. So the Brookings numbers I am sure are correct, but broadly speaking are reflective of our economic legacy as much as anything else. Yet another ranking showing the Pittsburgh region as just about the only place in the nation with increasing real estate prices year over year. See this press release: Summer's Last Stand: Clear Capital(R) Reports U.S. Home Prices Increase 4.0%. The headline there is about some decent quarterly numbers for the nation and a lot of regions, but year over years Pittsburgh's +3.9% stands out. The +9.5% quarter over quarter they are showing is pretty remarkable in itself. This is Pittsburgh right? What I am more surprised nobody has noticed is something generated via RealtyTrac and spotted in passing in reporting from the WSJ. Pittsburgh ranks near the top (not in a good way) in terms of the discounts properties being resold out of foreclosure are receiving in the market. So our post-foreclosure homes drop in value a lot, and relatively more than most everywhere else. I mentioned this over on the Pittsburgh Urban Blog and connected it to some work on Real-Estate-Owned (REO) property in the city. Likely a reflection of our lower foreclosure rate and healthy real estate market overall that those properties that actually make it to foreclosure are self-selected to be among the worst properties (value wise relative to their previous sales prices) on the market. Still a big deal for local neighborhoods. So it might just be my own distractions, but I really have not paid all that much attention to the referendum on the ballot in the City of Pittsburgh in the fall election. I really do wonder how many City of Pittsburgh residents know before going in there is a tax referendum they will be asked about.... or whether they will decide on the fly inside the booth (standing before the screen) how they will vote on it? I'd love to do a survey on that. If passed it will raise the property tax a smidge to bring in more money that will be dedicated to the Carnegie Library. To be honest, I am a big fan of libraries... who isn't I suppose, and I will be the first to point out the positive economic impacts I think they have... far more than most ever quantify. Still, that does not presuppose there is one best way to fund them. The RAD is a topic unto itself. We could talk about why it does not have more money for libraries.. which would bring us directly to the funding it provides for a few stadia in town.. something which was not part of the debate when studied prior to its inception. Hold that thought for another time. Also hold the really interesting question I want to come back to some day. Remember (or a few here might remember) all the noise when the RAD was being debated about how retail businesses would 'flee' Allegheny County because of how competitive it would be against the neighboring counties which did not have the extra 1% sales tax. Did that happen? Did it happen in part? It was once the central economic debate of the land. How has the retail biz fared in Allegheny County over the last decade? Again, we will come back to that. Back to the library tax.. and whether or not there is a lot of public fervor for it or against it is an interesing political dynamic. One reason this may not have the biggest public footprint may have to do with the nature of property valuation within the city. Who would really wind up paying the marginal higher property tax. Few taxes are as uneven as the property tax collected within the city of Pittsburgh. It goes beyond simple income stratification and even proportional to income the incidence of the property tax varies widely by neighborhood. Here is something we put up last year. Below is the actual property taxes collected by city neighborhood. There is an interactive version online as well if you want to study some of the smaller bubbles. What you see is first, the biggest single source of property tax revenues for the city come from Downtown, which is almost entirely commercial property. A lot of the newer residential property is mostly being abated anyway for now at least. Beyond that, most property tax collected is concentrated in just a handful of the 90 defined city neighborhoods. Folks in neighborhoods with the lowest values may not really notice. Neighborhoods with large percentages of their properties delinquent or otherwise not paying their property taxes probably have a lot of other issues that would displace much interest in whatever $$ this new tax will raise their bills. The net effect is that those that do vote will essentially be voing for whether others will pay a tax, not them. Not all that abnormal in a sense, but like many things Pittsburgh can be an extreme case given our circumstances. No, I just don't have it in me to comment on the micro blurb of news on property assessments, but feel free to go read yourself. I suspect all of 2012 here will all Assessments All Year Long. I was thinking that there was an all-Pitt half hour on NPR's morning edition today as they went from a story on Libya, where their Transtional National Council is being lead by Pitt political science grad Mahmoud Jibril, directly to the woes of the Postal Serivce which have been foisted upon Pitt econ grad and now Postmaster General Patrick Donahoe . Two folks taking over some nearly impossible jobs. We find setting routine tax values literally impossible. Two different definitions of 'impossible'. RustWire saved me the typing, so get the details from them on: the Great Lakes Urban Exchange (GLUE) conference here next week - Septemer15-17. GLUE takes a slightly different tact that the Great Lakes Economic Development (or GLED...gotta have an acronym) Committee that had one of its last big conferences here in Pittsburgh in 2001. I suspect the GLUE shindig will be more more fun anyway. Found by accident when looking something else up, I think I have come across the region's energy rosetta stone. I give you the Ohio River Basin Energy Study (ORBES). Date: 1981. and that is just the main report, there seem to be multiple ancillary reports. Take for example the: Regional Socioeconomic Impacts of Alternative Energy Scenarios for the Ohio River Basin Energy Study Region. or Land Use Analysis of Existing and Potential Coal Surface Mining Areas in the Ohio River Basin Energy Study Region. or Pennsylvania Baseline: Part 2 - Impact Assessment Data Base, Chapter 1 - Characteristics and Human Utilization of Natural Ecosystems, Section 6 - Water Quality. Well, you can't say we didn't study things in the past. Wiz will provide a summary of the above by the end of the week. I defer to Mike for the deeper thoughts today, but I just found curious that these two articles (we will call them exhibits A and B) in the PG were not rolled into one story. To treat them as distinct stories misses the real issues. Also, some might be surprised that Mike's views are shared by a few others in town. But on those stories... or more generally for Labor Day, just some stats you think someone might mention. 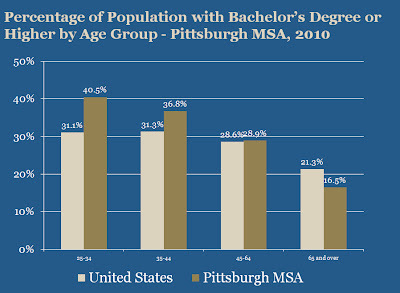 Percentage Hispanic in the Pittsburgh MSA, 2010: 1.3%. (and channelling the Carville corollary for some perspective, Alabama statewide is 3.9% Hispanic). Percentage of private sector workers in the Pittsburgh MSA that are union members in 2010: 10.8% (Unionstats). Wiz man... take a break. Grill a hot dog on that big NatGas grill or something. Give the 2nd shift the weekend off. But if you insist on reading, the peanut gallery would be interested in your take on the WSJ's: Obama Burns Gas Drillers on Ozone. Always expect the unexpected eh? Don't worry, I'm sure it will not abate the near term Marcellus (and Utica) rush, but it is the type of thing that will clearly have an impact on natural gas futures... which you would think would be capitalized into the value of the leases and eventually royalities. Makes for some interesting politics in the Greater Appalachian Basin. When do gas politics outweigh coal politics? Well, the pre-long weekend Friday afternoon blog post. If you are readingwriting this, it is a great weekend to go and get on a bike. But... to fill the void. It's not just Marcellus Shale that is bringing Texas to Pennsylvania these days. Who knew that Texas and Allegheny County would have some similar pension strategies? I have only one thing to say about the whole concept: counterparty risk. Actually I was kind of shocked that Allegheny County was engaged in the Dead Peasant insurance thing, but when I looked I saw that indeed it has been in the news. See the PG story from last year that laid it out: Pension Funds Bet on Death With Life Settlements. So it isn't even new. What really got me thinking was the very last sentence in that article from last year that relates to the pension board of Allegheny County's pension system. Go and read it, then go back and read last weeks PBT story on the machinations and statements from the City of Pittsburgh's pension board. Some very different perspectives. PBT has a follow up letter to the editor of note on the city's pension funding miasma. Finally... as much as the story du jour is the performance of the city of Pittsburgh's pension fund, the real elephant is how the other 3000+ municipal pension funds in Pennsylvania are investing their assets. You never see those stories because virtually nobody really knows how they have their cash invested in specific enough form to matter. there may be a few examples of transparency out there, but take the dead peasant example. I bet there are those and screwier investments out there that never see the light of day. and it does not follow.. but if you didn't catch it, the strangest economic development news item of the week was not about cupcakes, but doughnuts. For those asking, I can't really decipher the news today on the status of Pittsburgh's pension system. It is all quite odd. THE BIENNIAL ACTUARIAL VALUATION REPORTS FOR THE PLAN YEAR BEGINNING ON JANUARY 1, 2011, SHALL BE FILED BY THE CITY WITH THE COMMISSION BY SEPTEMBER 1, 2011. The immediate (possibly the only) question is whether the news today means that said 'valuation report' was filed with the state. The news says a 'letter' was sent out today (via carrier pigeon I presume) and that "....some backup documentation, which will be provided to the commission in coming days". The 'coming days' part is just where we begin to diverge from normal circumstances. Does any of that comply with the spirit or letter of the law? For the lawyers to decide I guess, but if you want to see what the state considers a "Biennial Actuarial Valuation Report" it is not ambiguious. Since you can't find them on any City of Pittsburgh web page you can check out my iPension page and over on the right are all the old Act 205 reports the city has filed with the state. Coincidentially enough these are also explicitly named 'ACTUARIAL VALUATION REPORT's and are normally submitted every other year (that would be the 'biennial' part). So call me simple, but it all comes down to whether the state expects such a report to be submitted to comply with Act 44, and whether in fact such a report exists and was sent to Harrisburg. Then there is this interesting question of how they fit the notional future pledge of revenue into the specific boxes provided on the form. Then the new issue of who will sign it. The form has space for a single official to sign the report, yet the news last week was that the Mayor wants the entire pension board to sign the report. They will have to write in cursive really small for that to work, but it is unclear to me if the pension board could sign the Act 205 report in the first place. It is a city official who has to certify it I think. So I think some one official needs to stand behind the report which I suspect is going to have some interesting disclaimers from the actuary tucked in there somewhere. This may become one of those B-School case studies in accounting for the next decade. Deep down, I suspect the issue of who is signing, and what they are signing is the issue at hand down on the 5th floor today. No reason to think the actual actuarial report is going to be any more done tomorrow if it is not done yet. Getting someone to put their professional career on the line to stand by it all would be an interesting decision for some. On this forthcoming supplemental information being provided to the state. There is this long weekend coming up. While I doubt your normal actuary is going to be working over the Labor Day weekend, I am absolutely sure nobody in Harrisburg is going to stay open in anticipation of some low-probability potential submission from the city. So this delay in complying with the Act 44 requirement quickly becomes a week I bet by the time anything really is provided.. and that assumes they get their act together quickly. When you consider the state was asking for information months ago because the timeline here for them to review what was going to be sent in was so short... the timing here takes on a bigger role. Whatever. This is fascinating, and is a great lesson in creating or just plain reading charts. Lots of buzz over a piece put out by the uber data wonks at the Energy Information Administration under the headline: Pennsylvania drives Northeast natural gas production growth. You just knew folks would obsess over that. The echo came first I think via NPR's new Stateimpact site, but spread at least to places like the PG's Pipeline, and of course was picked up by the Marcellus Shale Coalition and others by now I am sure. As best I can tell, few bothered to read what the EIA had to say as much as obsess on this one graphic they put out there. So you look at that chart and say OMG, look at all the net new natural gas is coming online! You have to believe that the storage capacity of the US is filling up quick and what I would really like to hear with winter approaching is that the price of natural gas must be collapsing. Soon they will be giving away the stuff. It's not like there has been enough time for any meaningful new demand to soak up all that new gas production. Still a long way from fleets of natural gas cars on the roads and we have made it past the peak energy demand of the summer. Of course, it isn't the case just yet. Natural gas prices are relatively low, but have been stable for much of the last year or so. Natural gas in storage is not too far from normal parameters. So what gives? If you looked at that graphic too quickly.. or didn't bother to look into the context more you might have assumed that the graphic depicted all US natural gas production. Go look again, it clearly says it is just for Northeast production. Remember also that natrual gas is shipped around the country in pipelines so it really is a national, or probably best described as a continental market with the entire Northeast not exactly a big part of the production story. So it is the supply and demand cumulative across North America that really impacts the market prices.
" Natural Gas: Although minor, Pennsylvania’s natural gas production has grown in recent years. The State’s Marcellus shale region, in particular, has experienced markedly increased new development over the past few years. However, compared to Pennsylvania’s total natural gas production, shale gas production remains minimal. " Note they start out with the description 'minor'. Clearly the 'minimal' part is changing, but even with the big increases in the last year, Pennsylvania is still far from a big part of total US production and a small fraction of production in Texas. You might not think so reading all the hype. A few folks I have had conversations with recently really believe Pennsylvania is now, as in already, the biggest natural gas producer in the nation. Some PR folks out there somewhere really deserve bonuses.